The General Counsel-Chief Executive Officer relationship, post Global Financial Crash, is under strain. The “generic” GC-CEO relationship is not what it should be. Many fear the other, feel frustrated with the other, and feel ambivalent about the other. The problem isn’t about lack of agreement on purpose, but on execution. If GCs won’t exploit their proximity to “the business” why not outsource the lot? “New Law” makes this easier. Equally, the “diving catch”, commonly performed by Legal, is not sustainable. The quality of the GC-CEO relationship is a “top and emerging” risk. Major risk events are inevitable if the GC and CEO fail to work together to create an environment in which a compliant, ethical and purposeful culture can flourish. Leadership and behavioural change consultant, Ciarán Fenton, argues for a shared understanding set out in an internal GC-CEO Memorandum of Understanding, one that addresses both the generic relationship issues and those specific to the organisation. This requires change – on both sides. 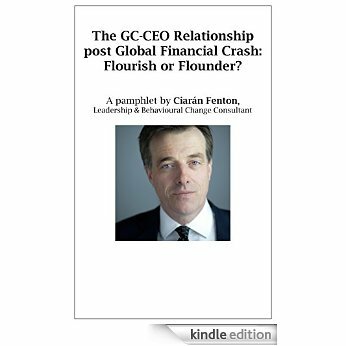 In this pamphlet, Ciarán sets out the nature of the change required and offers a solution, based on his extensive senior business leadership and consulting experience and his tried and tested model, The Fenton Model™. Posted on October 31, 2015 by Ciaran Fenton. Bookmark the permalink.